Digital Audio Group’s Livespeakr is an undeniably clever portable speaker system for the iPhone and iPod touch. The almost-pocket sized device, available in black or white, weighs just 12.8 ounces and is approximately 6 inches long, 2.5 inches tall, and 1 inch thick when collapsed for travel. What makes the Livespeakr so clever, though, is its unique adjustability. The removable cradle—which fits all current models of the iPhone and iPod touch—can rotate within the dock itself, letting you listen with your iPhone oriented in either portrait or landscape mode. When you rotate the cradle into landscape mode, the left and right sections of the Livespeakr (the parts that hold the actual speaker drivers) automatically slide out further to ensure they’re not obscured. The Livespeakr includes a built-in, fold-out stand that feels sturdy—it’s made of metal—and locks into place much like a patio chair’s back. Less sturdy, unfortunately, is the cradle that actually holds your iPhone. Sliding your iPhone into the cradle is easy, but attaching the cradle to the speaker itself—and keeping it there—is more than a little frustrating. The cradle sports tiny holes which are meant to snap onto small nubs on the Livespeakr itself; this attachment mechanism feels quite chintzy. In fact, i found it almost impossible to rotate my iPhone into landscape mode, expanding the speakers, without the cradle detaching from the speaker. The Livespeakr includes a built-in battery, which you can charge using the included USB cable or AC-to-USB charger. Charging takes between 5 and 7 hours, and the company claims a full charge will provide up to 16 hours of playback, which seemed realistic in my testing. Of course, since the Livespeakr connects through the headphone jack—this isn’t a dock-connector speaker system—you’ll want to keep an eye on your iPhone’s battery life, too. 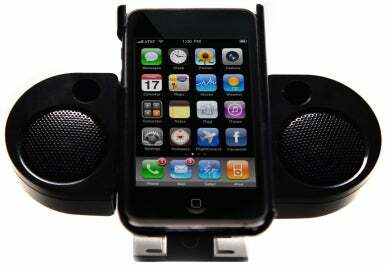 Once your iPhone (or iPod touch) is comfortably—or, precariously, as the case may be—nestled in the cradle and you’ve plugged the Livespeakr’s permanently attached cable into your iPhone’s headphone jack, you just switch on the Livespeakr and press play on your iPhone to start rocking out. The Livespeakr’s volume capability is impressive; its bass output is not—bass is essentially non-existent. But if you don’t mind your music skewing a bit trebly, the speaker certainly provides impressive audio punch and can play louder than I expected. If you rotate your iPhone into landscape mode, with the speakers spread apart, you might hear a bit of stereo separation if you center yourself perfectly in front of the Livespeakr, but like most compact iPod speakers, don’t expect to be blown away by audio quality. While fidelity is good enough that I was able to hear the difference between 128 kbps audio files and higher bit rate (256 kbps) files, I recommend the Livespeakr for pool parties, picnics, and other situations where fidelity isn’t quite as important as volume. The Livespeakr is RF-shielded, and I very rarely heard interference from the phone when music was playing. Unsurprisingly, you will hear some distortion as you crank up the volume, but it’s easy to find happy mediums that still provide plenty of volume. Given the carry-on-friendly size, the Livespeakr would also make a fine speaker system to watch movies on your iPhone in your hotel room, especially since the device supports landscape mode. I did find that the horizontal approach was less than ideal for listening to music, since the iPod app’s interface in that orientation doesn’t offer easy access to your playlists or track navigation. I ended up just picking up the whole device, speaker and all, to rotate the iPhone’s screen when I wanted to change tracks. I’d be a bit more enthusiastic about the Livespeakr if the cradle attached more securely. As designed, though, the Livespeakr is still a decent choice for non-audiophiles who want a portable solution for blasting their music.